I live in Wonder Lake, IL. There is a house that looks like a mini castle. Someone lives in there. If only I had known it was on market, I would have bought it. I went on a castle-hunt today and tracked down a couple of the "mystery" castles mentioned on your website and took some photos. This one is on the east side of Wonder Lake, Illinois, on a corner off of Beach Street. It is very well done, with good perspective. I was impressed, as "fairy tale" castles have to be the hardest to pull off. I received an email from a friend regarding the Wonder Lake, Il. castle house. My wife and I purchased the house in 1996 and sold it in 1998. 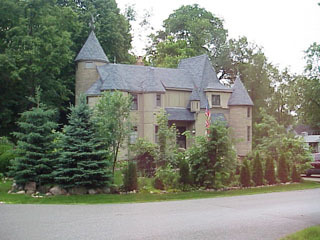 The home was originally built by Emil Von Knauf, a master papier mache artist from Austria. When he was a young man, he met a dancer in Chicago, and promised her that if she married him, he'd build her a castle. She did marry him, and true to his word he built the house himself! They lived happily in the castle until Emil died in the mid 1980s. His wife passed away about 2 years ago. We did quite a bit of restoration work on the home when we owned it, as have the current owners who are Polish immigrants. The house has 2 main bedrooms on the second floor, and a loft bedroom on the 3rd floor. The turrets are built of ornamental concrete, which Emil carved to look amazingly like stone. I was browsing through the Wonderlake sites, and came across your site. As a child, my family had a house on Oak rd. I was always facinated by that place. I'm sorry to report however, that I never knew of a name for the place. As a young man I always enjoyed the mystique of it. My folks still live in Wonderlake. Right down the street. My brother-in-law, Bill Duncan, bought the castle in the early 90's and did a lot of structural repair, I.E. ceiling joists, bay window, etc. He now lives in Belvidere, IL with his family. He sold the house after renovation due to an expected child. I am a grandniece of Emil Von Knauf and I came upon your Castle page about uncle Emil. Unfortunately, some of your facts are not correct. He was from Germany in a part of the Black Forest. Not only did he work in paper mache but he was truly an artist in several areas. As a young teenager I lived across the street from the castle. The story I always heard was the castle was the home of the man who made Garfield Goose, a TV paper mache goose that said he was King of the United States, King Garfield. This was a show for younger children broadcast from Chicago. Might have been WGS. The kids called it - the castle or Garfield's Castle. I grew up in Wonder Lake in the 60's and was always fascinated by the Castle. We live up the street from Mr. Van Knauf's workshop. All the neighborhood children loved to visit with him. He was referred to as Mr. "Van Off". We didn't know his real name, and this was an easy pronunciation. The little building he did his papier mache work from was like a small garage, and he kept geese and other animals in a fenced area there. We kids loved to go visit with him and he was always friendly and welcoming to us. But, unfortunately, it was that place all parents said 'never go there', and made it seem like he was that 'evil scary old man' depicted in so many TV show and movies. But he had animals, and he told us stories of his creations and his castle. (Unfortunately, I don't remember the stories, but I do remember the fascination of the visits!) He would show us his art projects, completed and works in progress. Stories we passed around that he was the artist that made the Garfield Goose puppet that was the title character of the WGN, channel 9, children's TV show in Chicago. This was never proven, but it was aid that he has another Garfiled puppet in his workshop, but we never saw it. I do not believe the castle was actually named Garfield's castle, but it was more so from the imaginations of the children in the town. Since the puppet Garfield on the TV lived in a castle, I believe many children in town thought the TV show was coming from the castle house. I lived next to the Wonder Lake, IL, Unknown Castle, from 1962-1975. I know that people refer to it as “Garfield Castle” because the owner (Emil Von Knauf) was reported to have created the paper mache puppet, Garfield Goose. I have never heard it called that, but rather we just called it Von Knauf’s Castle. The story about Emil building it for his wife because she wouldn’t marry him unless he built her a castle is a true story, as far as I know. I vaguely remember him telling my father and I that. What I always wondered was whether she envisioned that, or whether he built it and surprised her. I say that because she was not a very “enchanting” lady. I remember her yelling out her windows when we were playing in the small woods between our house and theirs. What a wonderful childhood I had peaking through the trees and bushes that completely surrounded the property. They were purposely planted, and very thick. They obscured the castle completely for most of the time I lived there. I also visited Emil’s workshop, which was in a basement (with no structure up above) immediately across from Beaver Rd. on Wonder Lake Rd.. My father (who is now deceased but probably could have told you more about the owner/builder) and I went into the workshop and saw a lot of pieces being worked on. I believe that Emil made lions for The Lions Club of America (for parades and such) and he made a big giraffe head that I believe was used in the marketing of Hi-C beverage (representing Hi-Cecil Giraffe mascot). It is my understanding that he got his start painting porcelain figurines which would sit on concert pianists pianos and at the end they swept their arms across the top of the piano and smashed figurines (composer busts?) to the ground. Either he did this back in Europe or he did it for Victor Borge as a joke movement; equivalent to today’s mic drop. I tried to search this “tradition” but couldn’t find anything, but why would I remember such detail as a little girl if there wasn’t some sort of truth to it? In my google searches I found this page which disputes that Emil made Garfield Goose. I had never heard that he made that puppet. However the article also talks about Emil Von Knauf being a prop man and making Elmer the Elephant. So, there is evidence that he worked on the Garfield Goose show, but not that he designed/built the goose itself. From the above link I also learned that he made a character made Elmer the Elephant. Here is a link to some footage of that charater on tv. No one lived next door to the castle in the early days except my mother. Emil also made props for the Lyric Opera House in Chicago; especially props that needed to be broken during the performance. This may overlap with the stories of props on grand pianos also being broken at the end of a performance. When first built it was covered in green tar paper (probably as a cost savings.) Over the years there were different upgrades under Von Knauf’s ownership including stone façade on parts of the castle and a very colorful roof. My father (a roofer) was asked to do the job but it would have been too difficult. Ultimately Von Knauf chose very vibrant, multi colors of roofing, which were mixed on the roof to give an “old world” look to it. It was shockingly colorful but he probably felt it resembled colorful slate roofs. One turret had a bedroom and another had a curved bathroom. Emil contracted Terra Cotta Industries in Crystal Lake to make the bathtub. This company made a lot of famous architectural pieces around the Midwest. Also, Laura Von Knauf wanted her own bedroom and they added one on in the middle of the castle. My mom said it was much bigger and had more sunlight than the one in the turret. The kitchen had two doors into it. Placed between those two doors was a large, antique stove that fit perfectly. As I write this, I wonder if it stayed with the castle through all of the sales. Photo courtesy of Bruce Busboom.